The first Crocus flowers are popping up here and there and that means it won't be long before the bees will be buzzing too. Timing is everything in a relationship like they have, and it has been so for ages. There's so much to say about their ongoing interaction that someone actually wrote a book on the topic! And guess what, some of my pictures are featured in it. The last days of travel are always a bit off. You want to make the most of it, yet your nose is pointing homeward. Taking in new and exiting memories is often blurred by last resort souvenir hunts. If you're in Panama city in October/November however, you just need to look up while sipping away that last cocktail. The masse raptor migration can blacken the sky. And so on November 2nd, the last day of traveling Panama, we could see many thousands of vultures and hawks on the wing from our rooftop bar (pool included of course). A long belt of birds traced from west to east. At certain points in the sky a thermal whirlpool of birds was rising in the air. That day observers on Cerro Ancon, counted a little over 2.1 million raptors flying over. While most citizens of Panama City take the raptor migration for granted, it sure is a treat for those who visit. In that urban jungle, with our bags packed, we got more than a little reminder of the overwhelming natural beauty that Panama has to offer. 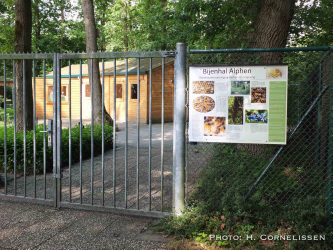 The beekeepers of Alphen en the surrounding villages (Noord-Brabant, The Netherlands) were looking for a way in which they could share the knowledge on bees and beekeeping. Since my dad is one of them, I was asked to help them out a bit. If your ever in the neighbourhood, be sure to pay them a visit (see the map below, for the location). When I visited Namibia a few years ago I was able to take the picture below. It was quite a funny sight. 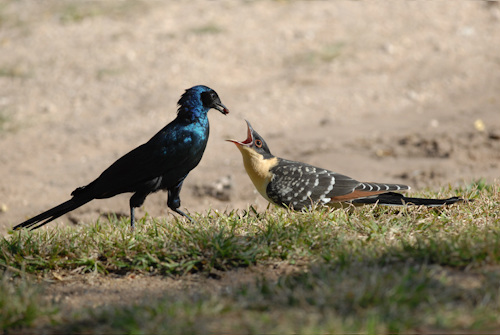 A Burchell's Starling is feeding a juvenile Great Spotted Cuckoo a berry. What you're not able to see is that the cuckoo actually repeatedly declined the berry by spitting it out. The surrogate parent kept on trying, but I guess the youngster wanted something with a bit of a bite. It wasn't until the Starling returned with a grasshopper, that the Cuckoo accepted the offering. What a baby! This picture was recently published in the 'Cuckoos of the World'.